The crew at South Florida Bounce is all for creating memorable moments at your party. However SAFETY FIRST. So our team in South Florida wanted to give you a few simple rules to keep your next bounce house party fun and safe. We’re often faced with many decisions as parents and as a community of people who genuinely care. While parties can be fun, we want nothing but the best and safest time for our patrons and their guests and we do everything to administer that safety. But safety is everyone’s responsibility when enjoying the use of bounce houses, slides and other inflatables. Here are some very simple and polite etiquette that will help ensure that your children and their company will bounce off into the sunset with minimum issues, keeping you safe. Hand Sanitizers became popular back in the 90’s, but has become more of a common practice. Many times you can find sanitizer dispensers when entering a hospitals or doctor’s offices. It’s important to use this tool before and after playing in the bounce houses. By doing this you’re taking an extra precaution to kill germs found on the hands. Make sure you have plenty of sanitizer on site when you rent a bounce house. In most cases shoes will not be necessary, but socks are good for keeping your child from getting scraped and can also enhance the fun without sticky feet that doesn’t allow a good maneuver throughout the apparatus. Although these are relatively safe, children can get stuck in the nets or scraped by the seems so more body coverage is better. Rough housing is expected when kids are playing in the house. This is one time they should be allowed to play and have a good time. However, kids need to understand that they can still be injured if they don’t follow ‘safety first’. Don’t allow bigger kids to throw smaller children inside the inflatable. This can cause things like neck and head injuries. Sharp objects like children’s toys can sometimes be forgotten when tucked into somebody’s pocket. Make sure the child only enters the bounce house with empty pockets and absolutely NO weapons should be allowed. Food and drinks are usually present at carnivals and events, but this is highly prohibited inside of an inflatable. Seems harmless but even water can cause problems when brought into these toys. Food particles can become bacteria if caught in the seams or sides of the houses. Even though every measure is taken to clean the houses after each use, we need to be pro-active for the safety of others. Supervision is always a mandatory tool that is implemented at every event. Parents need to be present or a responsible adult needs to always be in sight in case of emergencies. Remember, we are always available to help with further suggestions. If you are having a party and need to rent tables, chairs or any other party needs – Call South Florida Bounce – We have bounce houses for rent in Palm Beach County but we also have plenty of Party Rentals for all of South Florida. 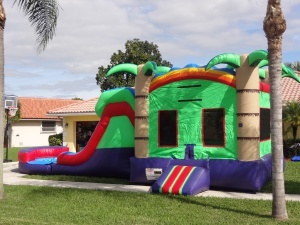 If you are looking to rent a bounce house in Palm Beach or Broward County give South Florida Bounce a call for all of your party rental needs.